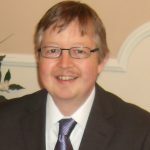 Providing the answer in finding a way round planning laws associated with erecting large walk-in storehouses, these small statures pave the way for sidestepping associated frustrations. Their unobtrusive posture refrains from dominating the landscape, low profile designs favourably sit beneath house windows and the maximum height regarding the common garden fence-line whilst others are intended to stand their back adjacent to a wall or slip into narrow spaces fulfilling service for restricted garden spots, slim backyards and tight patio locations. Their simplicity of assembly delivers such an easygoing construction procedure. In comparison to large self assembly outhouses, mini units are built in a fraction of the time, especially the low profile designs as their construction usually entails snapping the panels together & securing into place, job finished in a jiffy. A constitution of resin delivers long-term immunity from weather rot, integrating a floor composed of thickset resin far outweighs the rapid depreciation wood succumbs to stood on damp foundations whist a polypropylene or polyethylene manufactured roof remains unaffected throughout sunburn, rain and snowfall attack, quite the antitheses of a capped sheet of roofing felt. Replacing traditional varnish & painting chores in order to nourish a wooden structure is superseded by a leisurely scrub; the preferred option predominantly relates to a mild pressure-wash, we generally lightly sprinkle ours down with the spray-hose during soaking the plants on a summer’s eve. In contrast to wood, plastic’s a cinch to maintain. 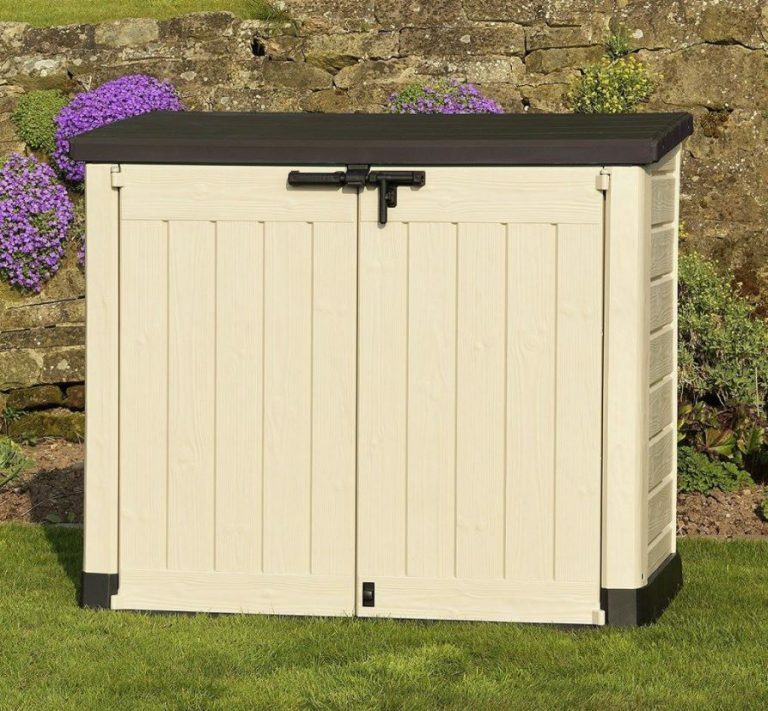 Mini-sized sheds only real downfall regards restricted dimensions however their plethora of advantages far exceed this negative leading the favourable solution to construct additional models to organise outside storage and situate in tight spots within a garden’s surroundings; one occupying gardening gear, another sporting goods, a third serving patio & BBQ accessories, as an example. Lifetimes largest deck storage container receives wondrous reviews all round, acclaiming to the dizzy heights by receiving a recognised award for quality construction accompanied with spacious storage accommodation accomplished Lifetime’s achievement of probably the largest sales out there relative to this deluxe category. A desert-sand polyethylene constitution formed into a dual skinned lining delivers protection against weather decay with robustness thrown into the manufacture, withstanding dents, sturdy enough to occupy bench seating whilst the flat lid provides a useful table-top, it’s diversity delivers ideal services particularly suited around a barbecue deck or situated around a swimming pool area. Inside there’s 130 gallons of storage capacity, able to occupy a generous amount of outside gear whilst a ribbed structure molded within the internal sides allows fitting your own dividers if desires are to more efficiently organise storage into various compartments. The lid is fit with spring hinges delivering a stay-open feature, swinging back slightly beyond 90° whist child friendliness remains at the forefront of Lifetime’s lid design. Operated by gas shock pistons the pressure prevents the top slamming down and trapping fingers whist assisting the opening is governed by the forced pressure. Contents inside remain dry thanks to the built-in flooring and waterproof seal which runs around the perimeter adjoining the box body to the lid whilst assuring security by preventing the lid from opening regards fitting a padlock through the clasp. The Max offers 320 Gallons of internal accommodation capacity, it’s one of the market’s earliest entrants relating to a resin composition. The size below regards the cheapest & most basic of models, called the Midi however the Max ups the game by incorporating those favourable user-friendly features we’re all looking for nowadays whist spanning larger dimensions to shelter supplementary storage. Cheap & cheerful, the Max boasts probably the most competitive of prices which is the huge draw however this early-plastic composition is a bit wavy & looks are a tad bland for some liking’s therefore reviews do come across rather mixed yet 5 star ratings are commonplace from those who accept this is a budget range, you get a lot for your buck! Manufactured from polypropylene resin whilst molded to display wooden styling exhibiting either ‘beige & green’ or ‘beige & brown’ two-tone shades, dependant on the model chosen. A straightforward assembly procedure constructs from the floor up, interlocking the surround to encase Max’s interior from the outside environment aiding to maintain the inside dry & free from debris. The lid incorporates a slight angle from back to front overlapping the facade ensuring the delivery of an effectual rainfall drainage system & dry atmosphere inside albeit ventilation is integrated for the dispersal of refuse odours if used for trash bin storage. Operating the heavy lid is fulfilled by the easy opening mechanism of the gas pressured pistons which furthermore forestall the top from crashing down. 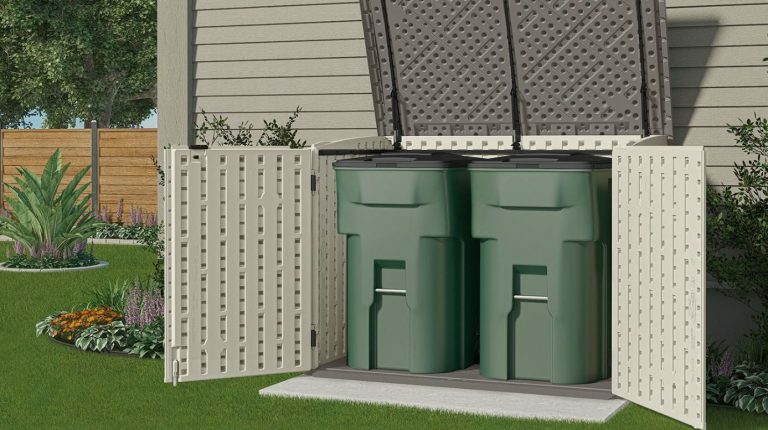 Included with the Max regards a bin opening chain kit, attaching the lid to the wheelie bin lids for hands-free waste disposal if such services are desired. The Stow-Away sits underneath the 6 ft height of a typical garden hedge, situates ideally against a house wall or locates where plot size is rather limited like restricted backyard zones and compact patios. A Blow-molding process produces a chunky walled skin of multi-layered panels delivering a staunch composition combining the durability of weather-resistant polypropylene whilst the wood-like structure is exquisitely molded incorporating a semblance of wood-grain embossed throughout the facade exhibiting a spotless vanilla glow. 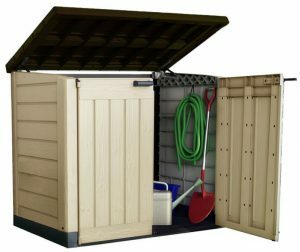 Designed with adequate height increases storage potential, whether intentions are for a dry-log storehouse, a sheltered utility for gardening tools, lawn & plant feed, BBQ accessories, kids bikes or a place to hide unsightly rubbish bins, this 70 cubic feet unit accommodates. Gas shocks enable effortless user-friendly entry whist the stay open design maintains the lid in an open position. Two metal hinges per door substantially operate the frontage access, once all three doors are closed a padlock clasp delivers simultaneous triple-way security. 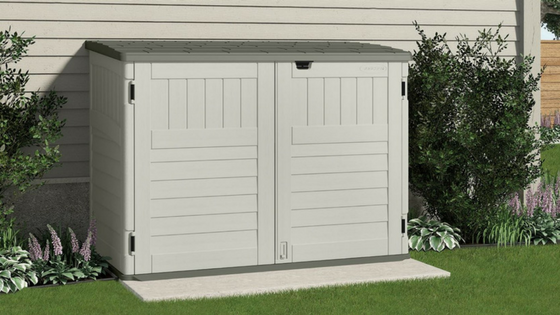 Assembly is made super-efficient on Suncast horizontal sheds by virtue of a supplied Easy-Bolt screwdriver. No other tools are required delivering the most friendly of construction processes, specifically intended for amateur DIY skills. 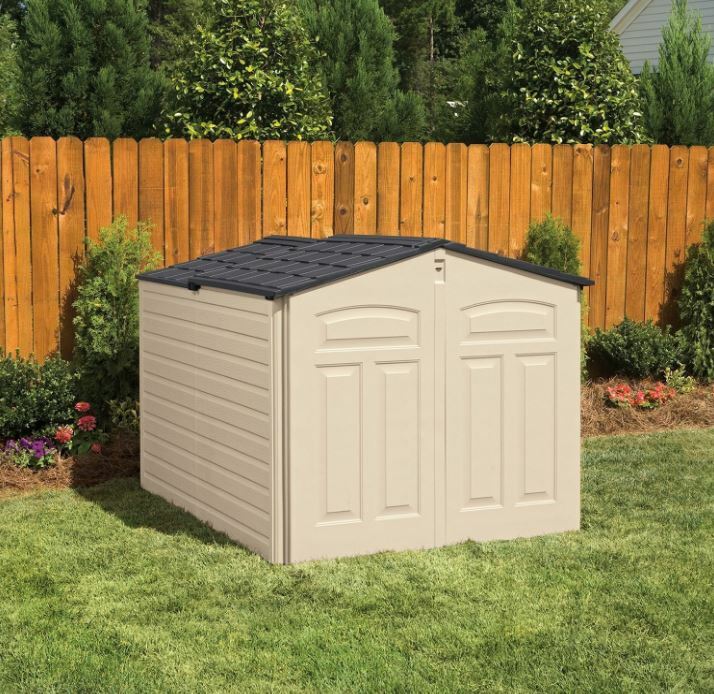 Don’t think you’ll have to get down on all fours and crawl your way through to the end of Rubbermaid’s low profile shed to grasp storage , the front half of the lid slides over the back portion opening the majority of the shed delivering Jim-dandy access. The Olive-Sandstone colour doesn’t portray very well in these images, head over to the review linked beneath this image to inspect the true colour. 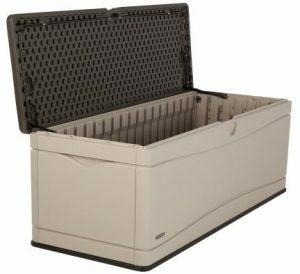 This Rubbermaid utility has tough competition from Suncast’s similar Gildetop facility which rolls in first-rate feedback, worth inspecting both models prior to decision making. 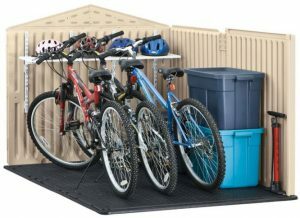 This style of design accommodates a large amount of storage including bikes and mobility scooters. 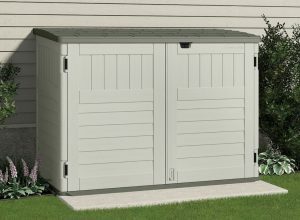 Due to increased stipulations regarding planning regulations in many areas, this style of inconspicuous presence is becoming a growing feature in many home-yards, a favourable approach regards purchasing additional models to organise storage and side-step large construction headaches. The only apparent down side to this Rubbermaid version relates to the plastic hinges that operate the doors, many wish Suncast’s metal hinges were incorporated here to increase sturdiness. Plastic doesn’t deliver as much resistance to swinging doors when under the influence of windy weather. Composition-wise, a dual lined make-up of polypropylene resin delivers robustness, defence against decay & the assault of sunburn. Rubbermaid’s staunch construction is topped off with a drain-able chunky apex roof structure whilst the floor is integrated into the facade panels sheltering the interior from outside. A three-way locking system provides security. Apart from a wash down to uphold appearances the only maintenance necessary regards a squirt of lubricant such as WD40 oil or silicon spray to keep the lid running smooth thus preventing jamming. There’s a growing number of quality polypropylene & polyethylene designed constructions making an entry into the storage marketplace. Weather-resistance accompanied with a trouble-free cleaning duty regards the preferred objective whilst placing the cherry on top regards their simplicity of assembly. Their only requirement is to be located on solid level ground however minuscule gaps are present within their ‘click-into-place’ interlock-mechanism therefore refrain from standing in a flood. 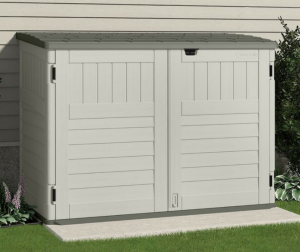 If you have a particular favourite mini-shed design, please share your thoughts in the comment section below. Please share these low profile units. Thank you! I really like the LIfetime Deck Box. In addition to have a shed, this is great to keep stuff handy for the grill or any outdoor cooking. I could see it as sort of an outdoor cupboard, for outdoor kitchen type stuff. The price is really not too bad either. It also looks durable enough to use as extra seating if necessary. What kind of warranty does it have? Thanks for reading about this small quite diverse range of low height plastic garden storage facilities. As far as quality goes, Lifetime do take some beating, reason for their award accomplishment and vast global sales. There’s no doubt Keter’s Store-It-Out low profile units have acclaimed to world-wide sales status due to fitting most budgets however these early entrants not as sturdy upon comparison. 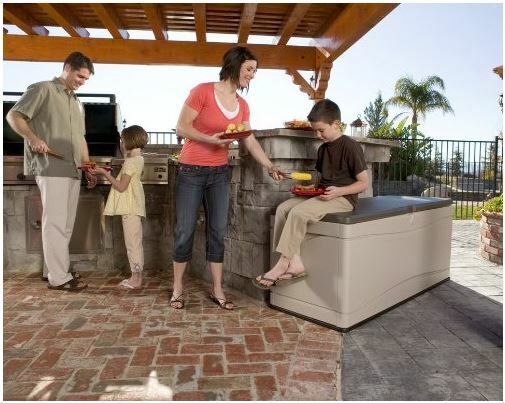 A deck box is a great invention to hide away grilling utensils sat on a BBQ deck plus this Lifetime version triples up as bench seating whilst offering table-top services too. We use our deck box for storing outdoor seating cushions, sure beats the frustrations of finding room indoors where to store as these are bulky items. Lifetime deck boxes come with a 10 years limited warranty cover. The only grumble I have come across regards the odd rusty hinge over time however many have had theirs replaced with stainless steel upon contacting Lifetime, pretty much the Rolls Royce of deck boxes.